SAN DIEGO, California, November 5, 2004 -- Researchers at the University of California, San Diego will use advanced communications equipment contributed by Fujitsu Laboratories of America to link two experimental optical networks. The Sunnyvale, CA-based company is the U.S.-based research arm of Fujitsu Limited, a leading provider of customer-focused information technology and communications solutions for the global marketplace. The contribution of an 8-port, 10 Gigabit Ethernet switch Fujitsu XG800 (with 8 LR XENPAK modules) is valued at $80,000. The equipment will be deployed in the Concurrent Systems Architecture Group of Computer Science and Engineering professor Andrew Chien. "We are grateful for Fujitsu's support which will enable a wide range of exciting research opportunities in new and ongoing research projects involving networking, grids, and robust, secure distributed systems," said Chien, who holds the Science Applications International Corp. (SAIC) Chair in UCSD's Jacobs School of Engineering. "Fujitsu's single-chip switch is an innovative, leading-edge design and is an important piece of our leading-edge optical network environment at UCSD." "Fujitsu has a keen interest in the development of tomorrow's information processing and networking technologies," said Akira Hattori, Senior Vice President at Fujitsu Laboratories of America, Inc. "We are impressed with the range of research projects that will benefit from using our XG800 switch." The Fujitsu switch will be used by researchers associated with several networking projects on campus, including two already funded by the National Science Foundation: FWGrid, a $1.8 million grant to outfit UCSD's new Computer Science and Engineering building with an experimental Fast Wired and Wireless Grid to explore large compute (teraflops) and data (tens of terabytes) capabilities of state-of-the-art technologies; and the $13.5 million OptIPuter, which is designing a revolutionary new architecture for distributed cyberinfrastructure to support data-intensive scientific research and collaboration. "Both of these projects will benefit from the ultra high bandwidth that the Fujitsu switch provides," said Larry Smarr, director of the California Institute for Telecommunications and Information Technology [Calit²] and principal investigator on the OptIPuter project. "The equipment will link FWGrid to other OptIPuter locations, and move us quickly into the fast-growing, 10Gb switched lambdas field-helping researchers to explore massive amounts of scientific and biomedical data interactively." Lambdas are individual wavelengths of light that can transmit data through optical fiber, according to Smarr, who holds the Harry E. Gruber Chair in Computer Science and Information Technologies in the Jacobs School. 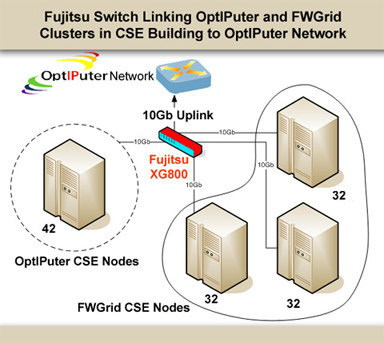 The Fujitsu XG800 switch bridges the FWGrid and OptIPuter resources in the CSE building. FWGrid's 192 processors deployed in 96 HP ProLiant DL145 systems will connect to several OptIPuter clusters in the same building with a total of 42 compute nodes. The XG800 will transmit data via one or several 10Gb links to the rest of the OptIPuter network at UCSD, including one storage cluster with 48 nodes, six visualization clusters with 49 nodes, and five compute clusters with 313 nodes. A typical data object distributed within this infrastructure - e.g., detailed imaging of Earth topography, or brain scans - can easily scale up to gigabytes of size. To interact with that data in real time requires high-speed, predictable 'clear channel' networks. A recent test of the Fujitsu switch involving 10 pairs of simultaneously 1 Gigabit per second (Gbps) communication demonstrated that the switch is sustaining 9.4Gbps simplex (one direction at a time) on two ports. Fujitsu Laboratories of America, Inc., the U.S.-based research arm of Fujitsu Limited, focuses on advanced research in Internet-based technologies, pervasive computing, LSI technologies, interconnect technologies, computer aided design tools for next generation VLSI circuits, and photonics technology. Fujitsu Laboratories conducts research in an open environment and collaborates on projects with leading academic research institutions and other research groups, participating in technical conferences to promote the free exchange of ideas. As part of Fujitsu's global R&D network, Fujitsu Laboratories of America is dedicated to advancing the frontiers of information technology through collaborations with leading researchers throughout the world. For further information, please visit http://www.fla.fujitsu.com/.